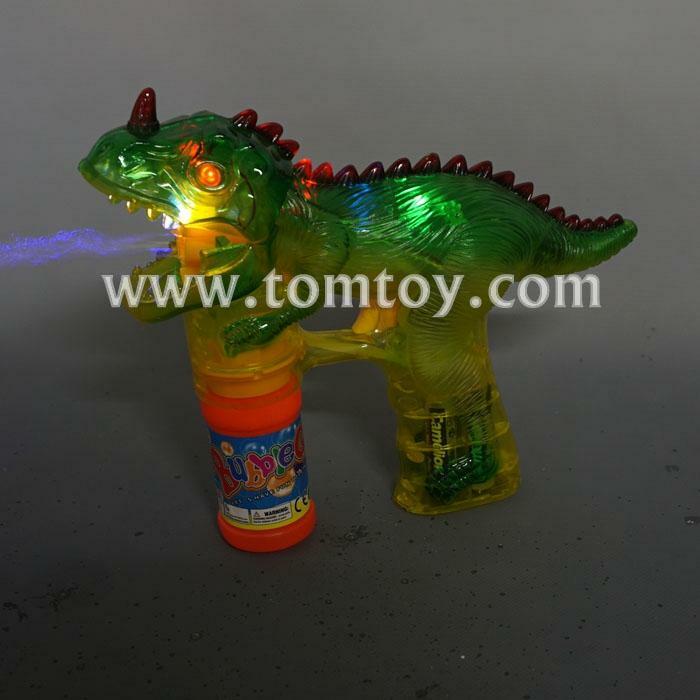 1.LIGHT UP BUBBLE GUN.Multi-colored bubbles shoot out of the dinosaur’s mouth at a fast pace with flashing lights, providing hours of endless fun. 2.EASY ASSEMBLY. Simply take the cap off of the bubble bottle, then screw the bottle onto the bottom of gun underneath the dinosaur’s mouth. An automated system takes care of the rest. 3.LED FLASHING LIGHTS. Multiple LED lights illuminate at the same time the bubbles are coming out for double the fun. Simply pull and hold the trigger to release a continuous stream of bubbles with flashing lights. 4.READY TO USE. For added convenience, this toy comes complete with a Dinosaur Bubble Shooter Gun and two bottles of non-toxic bubble solution. It runs on three AA batteries, also included with your purchase.